Today I was at the Sabolciu gypsy village from 6:00 – 9:30pm for our first outreach evangelism service in the village. Two words to describe my time there was WOW God!!! At the beginning of our time there we encouraged people to come to the evangelism service and then it started at 7:00pm. We had four guests from another gypsy village near Arad and it was just so awesome! They sang songs and the Pastor from that village preached a powerful message on salvation. It was awesome to see him preach both in Romanian and in the gypsy language! I praise God for the four ladies and three children that gave their lives to God today!! A couple of weeks ago one of my friends prayed for me, the Lord touched me very powerful during that prayer ministry time and God spoke to my heart the word “harvest”. I truly believe in my heart that this is the beginning of the harvest of souls that is bringing into His kingdom from Sabolciu! It’s very exciting to see how God is working and I’m looking forward to seeing what He will do tomorrow and Monday for the rest of these outreach services. Tomorrow Steve (he’s from the States) will preach and on Monday Ghita will preach (he is a Pastor from another gypsy village called Tinca). Today the church was quite full with the women and there were also some men there too but not a lot. Please pray that God will bring everyone back to church tomorrow, Monday and also in the weeks to come. Please pray that God will bring more people and more men too. We really appreciate your continual prayers so very much!! I would like to thank-you from the bottom of my heart for praying and standing in the gap for the people in the Sabolciu gypsy village. Blessings! 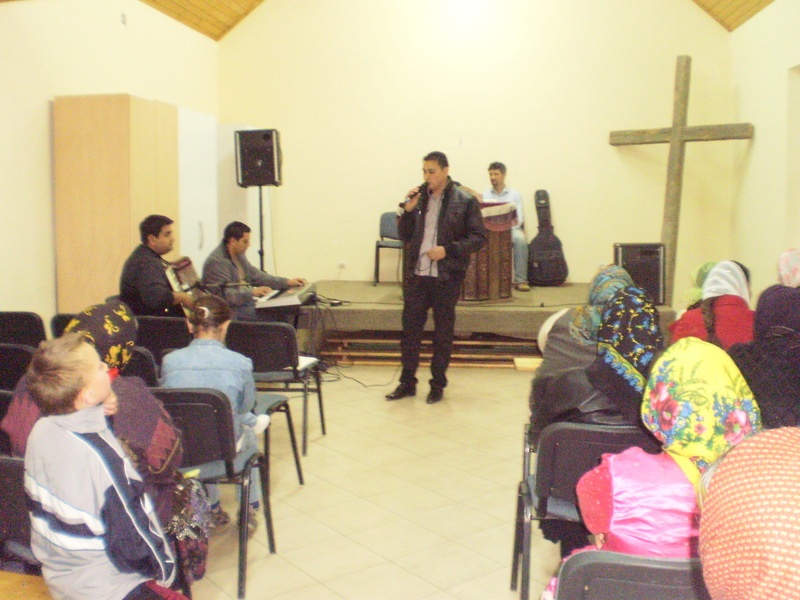 The first evangelism outreach service in Sabolciu.